With a degree of freedom to innovate, the cars seemed faster this year. That was my perception from trackside, anyway. With 20kW higher maximum power allowed for 2015/16, perhaps it’s obvious that they would be quicker. It’s hard to know if lap times can be directly compared with the 2015 results, as the timing line had been moved and there may have been changes to the track layout. Buemi’s 1:22.033 set in Sunday Superpole compared with Sarrazin’s 1:23.901 from 2015. It could mean progress, or it could mean just statistics. After the TT Zero e-bike race on the Isle of man in June was something of a damp squib this year, with the diminished field and John McGuiness’s unfortunate/ridiculous kill-switch problem, it was good to see the full field of Formula E cars make it to London and put on such an exciting couple of races. And there should be more cars next year as Jaguar joins the series. I don’t know whether Buemi slowed abnormally into that turn in the final race or di Grassi deliberately rammed him, but their clash shows how the drivers really are taking Formula E seriously. Clearly, it’s real racing for them, not just test driving; even though the equivalent of less than 400 BHP can’t be terribly frightening. The driving may have been questionable in terms of sportsmanship, but to see them pushing so hard bodes well for the future of the series, and for EV advancement in general. Let’s hope for even more power and more speed next year. Interesting to note, in the e-village, that the Renault Zoe EV can be bought for as little as £15,000. That’s really not bad for a car that offers such a low price per mile in terms of energy costs. It even looks like something a “normal” person would drive – Nissan Leaf take note. After 2015 and 2016 in Battersea Park, the London ePrix moves on to we know not where for next year. So, speed comparisons versus this year will again be meaningless, and there will be no getting away from the high catch fencing that is the trade-off for being able to get so close to the action. The way to get better photos is to stop whining and apply for a track pass. Picture: Nico Prost, snapped from the wrong side of the fencing, races to the first of his weekend’s back-to-back victories, Saturday July 2. What a fantastic event, Sunday’s London ePrix was! The “bringing it to the people” idea behind choosing city-centre locations certainly seemed to work well on a summer afternoon in Battersea Park. The cars’ performance – and yes, even the sound – is dramatic when standing trackside. One drawback of not racing at established circuits is that we can’t really compare the performance of the Formula E cars with conventional single seaters. On the other hand, they have now established their own set of benchmarks. The leap forward in season two should be quite significant. Another drawback is that the track in the park was very narrow, which seemed to thwart quite a lot of overtaking (Mr Buemi?). And although I appreciate the safety aspect, it would be nice to have some photographs that aren’t blighted by chicken wire. Any chance of resurrecting Crystal Palace for next year’s London race? Anyway, we should recognise the technical achievement behind this first championship. At that level of technology, to have four spec cars for each team, at each race, with all the know-how and spares back-up needed for that amount of track time, deserves respect. Moreover, all credit to the FIA for supporting it so well. I’d like to see the FIM get behind e-motorcycle racing in the same way! I’ve just finished reading Charles Morris’s fascinating book about Tesla. It’s quite an eye opener in many ways. Surely not many people would (or could!) front up $41 million of their own money to help their startup through a sticky patch – but the way Morris tells the story, this gesture made a defining moment that won the confidence of some serious backers. Fair Play to Elon Musk! My last post suggested that unfeasibly good looking EVs are needed to help the electric revolution succeed. Morris’s book provides an idea as to why earlier EVs tended to be either incredibly bland or just plain ugly: the manufacturers were not really interested in selling them. Apparently California law obliged them to include an EV in their product ranges, and they grudgingly complied although they had very little desire to supply or support them. Thankfully that’s changing, and now there are some really eye-catching electric cars for us to look at and maybe even aspire to own. A few broke cover at the recent Geneva auto show, including the Quant concept vehicles as reported by (it’s that man again) Charles Morris in Charged EVs. There is also the Koenigsegg Regera. Perhaps that’s outside the scope of this blog, as it’s not strictly “solid-state” motoring: the twin-turbo 5.0 litre V8 sees to that. But it does have three Yasa electric motors. 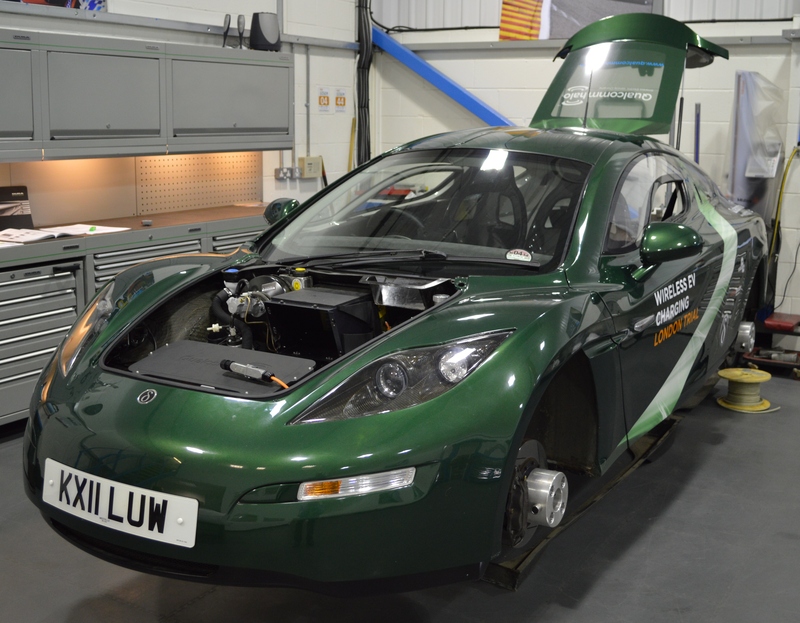 Yasa motors also power the Delta E4-Coupe, a pure EV built by Delta Motorsport at Silverstone that has functioned as a demonstrator for various technologies including wireless charging as I described in my article in New Electronics last year. In fact, Delta helped develop the Yasa motor to power the E4-Coupe. I think this is a great looking car. I love the doors; and the nose; and I’d like to be sitting behind that steering wheel. Hopefully we’ll be seeing many more fantastic electric shapes, not only gracing motor show stands, but the roads as well. The spectacular failure, last year, of Fisker Automotive, having swallowed hundreds of millions of dollars of investment, should not be a surprise. In fact, we should probably be more surprised that a startup such as Tesla has so far succeeded in the risky, emerging, EVs sector. The history of startup businesses aiming to sell cars to consumers should pose a warning to anyone contemplating such a venture. But it’s great for the future of EVs that people still go ahead with crazy plans. The craziest is to target high-volume sales of a premium sports car like the Fisker Karma. The DeLorean affair is another well-known example. Joann Muller’s article about Fisker and Tesla in Forbes magazine also recalls the doomed Bricklin sports-car startup – a marque that I first encountered while playing Top Trumps in the school playground (actually I was quite pleased to be dealt the Bricklin, as it had a vast V8 engine that would beat most other cars in the pack except something like the ludicrous Panther 6. The Panther was another crazy idea destined for failure…). Good-looking electric sports car proposals, however unlikely to succeed, must keep coming forward if EVs in general are to succeed. Although few people will buy them, lots would want them, and that kind of attention is needed to help sell the more practical and affordable models that are better able to deliver a return on their creators’ investment. In the past, car makers and styling houses would craft eye-catching sporty “concept cars” to generate interest in their brands. Posed seductively at the world’s motor shows, or in photographers’ studios, some were even driveable – although never usually intended for production. I can say from experience this was often a source of disappointment for young Top Trumps players. How I wish Ferrari had produced Pininfarina’s Modulo, or that Lamborghini had put the Bravo or Athon into production. Kudos to BMW for making the M1; classic car dealers can turn a profit on the car now, but I doubt BMW did. As a promotional tool for its M-Sport brand, however, it was arguably very effective. As far as Tesla is concerned, Katie Fehrenbacher on gigaom.com suggests that developing its own IP has been a key factor in the company’s success to date. Something Fisker apparently did not do. But maybe it is finance that has really been the key factor for Tesla. It seems the business has consumed almost every cent that founder Elon Musk made from PayPal, and has attracted copious investment capital, while also benefiting from cleverly selling millions of US Dollars of carbon credits to conventional car makers, according to Muller’s article for Forbes. The new Model S also happens to be, in my opinion, an extremely attractive and desirable car. 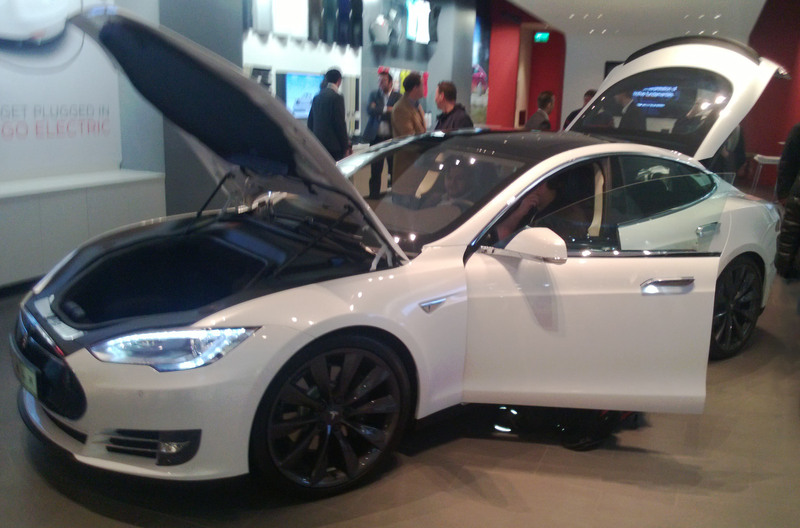 One place to see it is in West London at Tesla’s new retail unit in the Westfield Centre at White City. 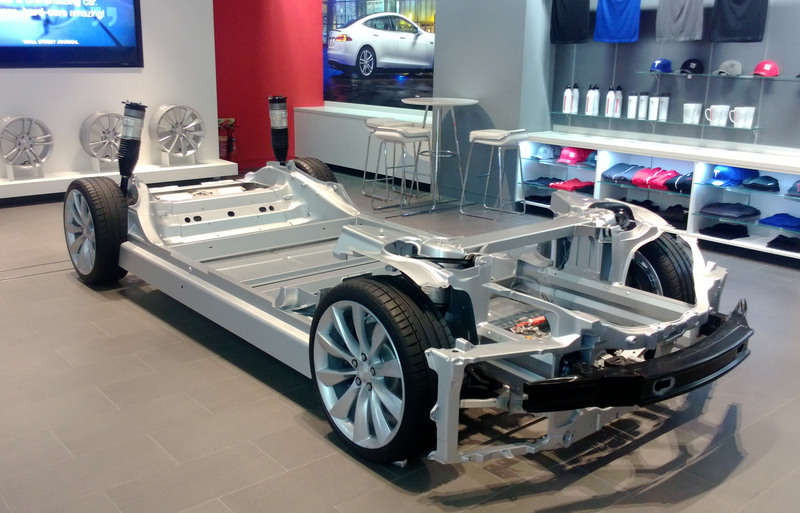 The bare chassis on display next to the demonstrator illustrates the amazing compactness of the motor and drivetrain. Now looks like a good time to be in the EV business, but to embark on a sports car startup may be only for those with deep pockets or no fear of failure (or both). 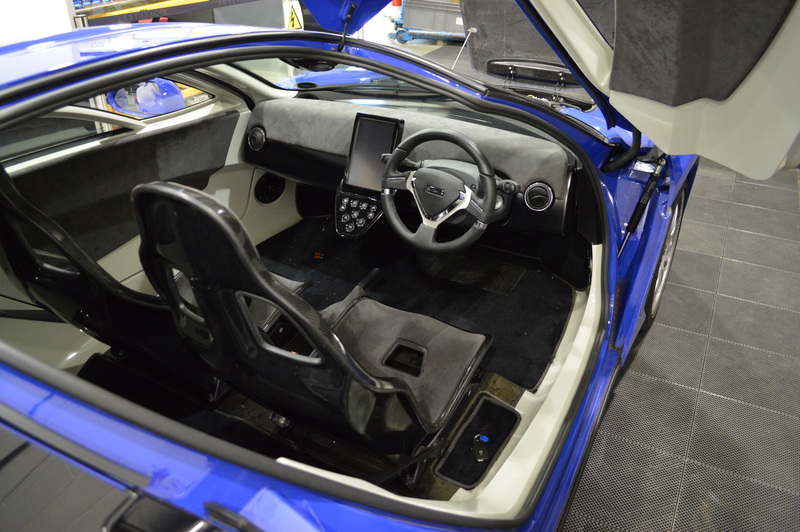 Startups may be better advised to concentrate on building a superior motor, battery, control electronics, or user-interface application, and leave established car brands to wheel out the aspirational sports cars that will help turn the once-leftfield EV into an object of mass-market desire. Like a lot of boys, I’ve been mad about cars almost my whole life. Sometimes I’ve even called myself a petrolhead. I like them loud, fast and beautiful. I’m also inspired by electric vehicles. Perhaps getting older has made me appreciate the idea of a quiet ride. Really, what’s getting me on board is the emergence of EVs that are fast and beautiful. It will be fascinating to see how they will evolve from here. I think they will move forward far more quickly than combustion engine vehicles at the beginning of their development. In this blog I hope to keep pace with the advances in technologies driving electric vehicles. And why Solid-State Motoring? Because I’m sure people in the future will be horrified at the notion that we used to pour liquid into our cars and burn it to make them go.